Just sending a quick newsletter for those of us that have to do church inventory before the end of year. I just got finished with these free forms and wanted to make them available to you. I know your busy doing your end of the year paperwork, I hope these forms will help you. I hope everyone of you have an easy way to get your Annual Contribution letters out to your members that doesn't take days to get out...if not then remember I still have Shepherdbase on sale and you can generate your Annual Contribution letters within minutes and ready to mail out. I have decided to keep running the Christmas/New Year Special for Shepherdbase (Church Membership Database) of $29.99 through the end of January 2011. You can click here or see below for more information regarding Shepherdbase. Shepherdbase will give you an easier and more convenient way to track church members and their contributions and lots more. 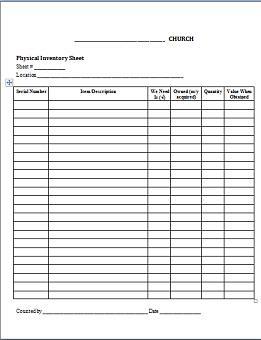 The Church Inventory forms helps relieve any doubt as to whether the item in question was given or loaned to the church. Any item marked with a serial number will need to be listed on the forms. It's probably a good idea to have some kind of control over your church property. Mark the church property with the church name and an inventory control serial number. If you have an item doesn't have a serial number then you know that it was loaned to the church. You can use mailing labels and print from your computer or typewriter. Keep an official listing or database of the property. Have a designated person to keep track of all the inventory records. Stay organized and keep the forms simple. I have four church inventory forms available. Click here to access the forms.